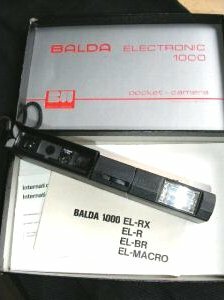 Balda manufactured the Minox 110 and the Minox 35 range for a number of years. and when Minox lost interest Balda went on to market similar 110 cameras, both in style and quality. Balda manufactured the plastic Minox 110S and Minox 35 EL cameras. When Minox decided to discontinue the production of the 110S Balda continued production with their own version the 1000 EL BR including the "french door" protection cover over the lens. Like the Minox 110S it has a electronic shutter with speeds of 4 seconds to 1/1000. Both have a CdS meter providing aperture-priority automatic exposure control and have a coupled-rangefinder. The Minox has a 25mm (f2.8-22), 4 element/3 group lens, were as the Balda has a wider but slower 20.5mm f4.0 optic. The Balda 110 cameras are harder to find than the Minox 110S, but are now less expensive. Similar to the EL BR, but with the addition of close-focusing capability. Similar to the EL BR, but with a faster f2.8 lens and so more like the Minox 110S.